Class implementing WebSocket-based channel to create faces. Definition at line 43 of file websocket-channel.hpp. Create WebSocket channel for the local endpoint. 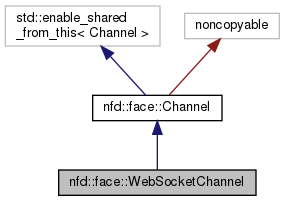 To enable creation of faces upon incoming connections, one needs to explicitly call WebSocketChannel::listen method. The created channel is bound to the localEndpoint. Definition at line 36 of file websocket-channel.cpp. References nfd::getGlobalIoService(), NFD_LOG_CHAN_INFO, and nfd::face::Channel::setUri(). Returns whether the channel is listening. Definition at line 57 of file websocket-channel.hpp. Returns the number of faces in the channel. Definition at line 63 of file websocket-channel.hpp. Enable listening on the local endpoint, accept connections, and create faces when remote host makes a connection. Definition at line 149 of file websocket-channel.cpp. References isListening(), NFD_LOG_CHAN_DEBUG, and NFD_LOG_CHAN_WARN.